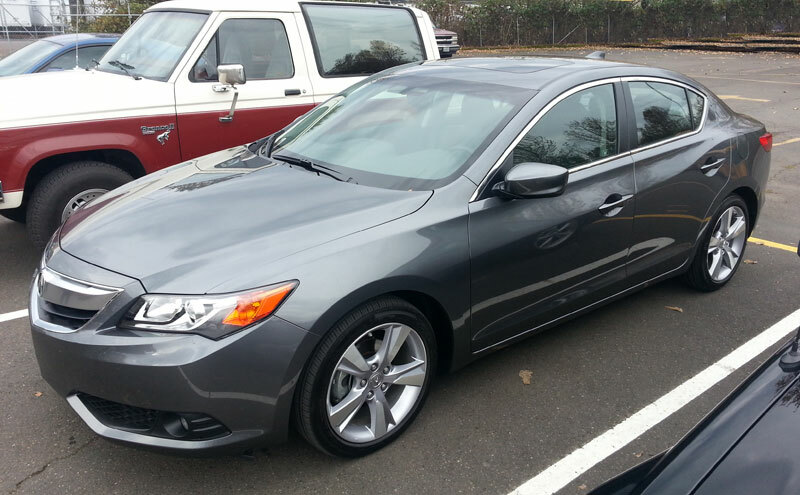 In the driveway this week, despite the photo of the car in this parking lot, is the 2013 Acura ILX. The ILX comes in three distinct flavors: 2.0 with the five-speed auto, the 2.4-liter with the six-speed manual, and Hybrid. This is the 2.0-liter version with automatic and the Technology Package. Based on the Honda Civic, the ILX is well appointed inside and out. I happen to think it looks more attractive than a 2012 Civic inside and out, too (no offense, Scotty). The 2.0-liter engine makes 150 horsepower and feels adequate, but not much more. It is a smooth engine, especially for a four-pot, and shifts are velvety smooth. This puppy runs just a tick over $30,000 as shown, and it's decked out with all the tech goodies you see here plus HIDs, leather, moonroof, etc. I can't help but think, will this cannibalize four-cylinder TSX sales? Also, is this model a solution to a non-existent problem? I mean, are people willing to buy a 150 hp compact luxury sedan? While we can't definitively answer these questions, we will drive this over the next week and report back with some of our opinions. In Canada they had the Acura EL and CSX until the ILX came along, yet the TSX sold well up there. 2013 may very well be the last year for the TSX. I had a 2004 TSX and it was a great car, but I don't see myself driving an ILX. The price of the ILX is quite high for what you get. I drove all three versions of the ILX at a media event over the Summer and thought it was okay, but I would take a G37 or even a TSX at the price its selling for. One is that it has that giant chrome proboscis that has afflicted all current Acuras. Can someone arrange a "group buy" on some rhinoplasty for Acura's lineup? The second is that I can't help thinking of this ILX as a modern Japanese Cadillac Cimarron. Just as the Cimarron was a gussied-up Chevy Cavalier, the ILX is just a gussied-up Civic. Admittedly, the Civic is a better car than the Cavalier ever was, but it's still an entry-level econobox that was not designed with any luxury pretenses. Sticking an ugly chrome schnoz on a Civic does not produce a luxury car. I can't see too many buyers lining up for a $30,000 Acura Cimarron.